Readers will find here not only the country's leading conservative thinker offering a pas­sionate defense of limited government, but also a highly independent mind whose views-on feminism, evolution and the death penalty, for example-defy ideological convention. 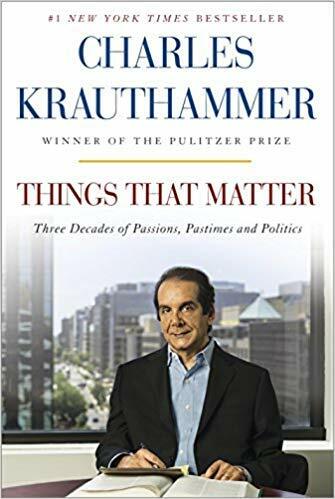 Things That Matter also features several of Krautham­mer's major path-breaking essays-on bioeth­ics, on Jewish destiny and on America's role as the world's superpower-that have pro­foundly influenced the nation's thoughts and policies. And finally, the collection presents a trove of always penetrating, often bemused re­flections on everything from border collies to Halley's Comet, from Woody Allen to Win­ston Churchill, from the punishing pleasures of speed chess to the elegance of the perfectly thrown outfield assist. With a special, highly autobiographical in­troduction in which Krauthammer reflects on the events that shaped his career and political philosophy, this indispensible chronicle takes the reader on a fascinating journey through the fashions and follies, the tragedies and triumphs, of the last three decades of American life.